What is Small Form Factor? How is Small Form Factor defined? 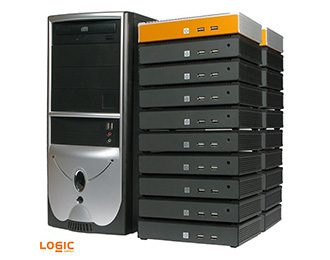 At Logic Supply, we refer to the vast majority of our systems as small form factor (SFF). While there’s no universally accepted definition of a SFF computer, in general the industrial computer industry defines a small form factor computer as anything smaller than your standard desktop, or systems based around motherboards smaller than Standard-ATX. Here at Logic Supply we offer systems ranging from a couple of feet long, in the case of our rackmount systems, to just a few inches. We specialize in Mini-ITX based systems, built around motherboards that measure 6.7 x 6.7 inches. We’ve also worked closely with Intel to build enclosures and systems based on their NUC form factor, which measures 4 x 4 inches. One of the limitations of small form factor computing is the lack of room for expansion. Many of our industrial enclosures are only slightly larger than the motherboards they contain, but in some applications expansion capabilities are a key concern. With expansion and configuration flexibility in mind, we also offer systems that can accommodate expansion cards for additional I/O or wireless connectivity, as well as additional storage bays. The key is finding the optimal combination of small footprint and capabilities, which is why fully understanding the use case for each system we sell is so important. Does small footprint ever relate to energy requirements? When we discuss small footprint, we are typically referring to the physical size of the PC. Our computers are engineered to be integrated into existing systems and their small footprint allows for easily installation, even in pre-established small spaces. That said, most of our computers have a low TDP (thermal design point or thermal design power), which enables us to create completely fanless systems that are also much smaller than a traditional PC. At the same time, many of the Intel CPUs we use require very little power to operate at full capacity, so in many ways, regardless of how you refer to small footprint, the term applies to our systems.